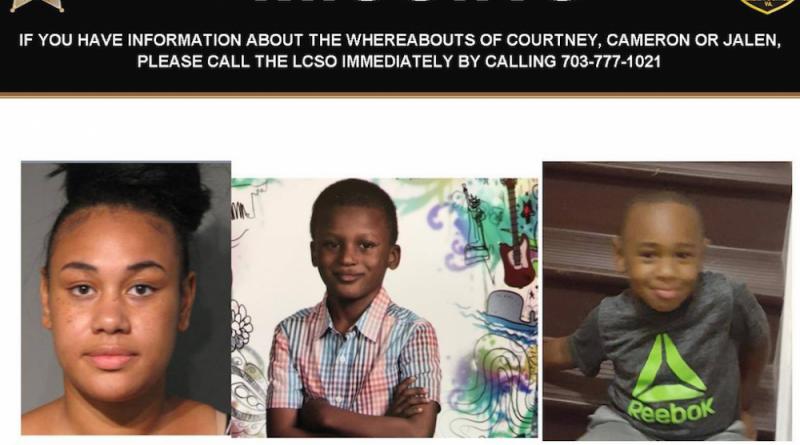 The Loudoun County Sheriff’s Office is asking for help locating a woman and two children who were last seen Friday night. Courtney Ashe, 27, of Suffolk, was last seen leaving a family residence in Ashburn with Jaylen C. Sills-Russell, 9, and Cameron A. Martin, 5. Ashe had traveled from another family residence in the Leesburg area with Jaylen, a cousin, to pick up her son Cameron. The three were expected to return to the residence in Leesburg but never arrived. The three were reported missing to the Sheriff’s Office on Sunday and there is concern for their well-being as they have not been seen or heard from since Friday. The three are believed to be traveling in a four-door 2002 blue Ford Taurus with Virginia tags VUV-9844. Anyone with any information about the case is asked to contact the Sheriff’s Office at 703-777-1021.